Occasionally I receive the best-ever sort of email, which is the sort of email where someone says that something I wrote or did has inspired them to do something else. That’s very nice. Obviously it doesn’t happen that often, so it’s special when it does. In this case, I heard from Jonathan Petherbridge, Creative Director of the London Bubble Theatre Company, which is a remarkable community-focused organisation that uses the process of making performances to nurture well-being and social bonds. He had read and liked Making is Connecting, which makes sense because the book’s arguments line up perfectly with the Bubble’s work – people collaborating and developing a sense of collective purpose and well-being through making performances together. But he especially wanted to tell me about a particular initiative which was prompted by the book – and, no doubt, by many other thoughts and influences – and by the Men’s Shed movement in Australia. This was the Rotherhithe Shed, which is a space for (primarily) older men to get together to make stuff. I was expecting to be seeing an actual shed – okay so I hadn’t entirely thought it through, but I thought the Rotherhithe Shed would be a shed – but it’s actually the large workshop space within the theatre company. Some of the time it is used for making theatre staging and props, but a lot of the other time it had been unused, so then Jonathan had the idea to create a ‘shed’ type place for local people. Members are welcome to drop in and out at any point during our opening hours (above). 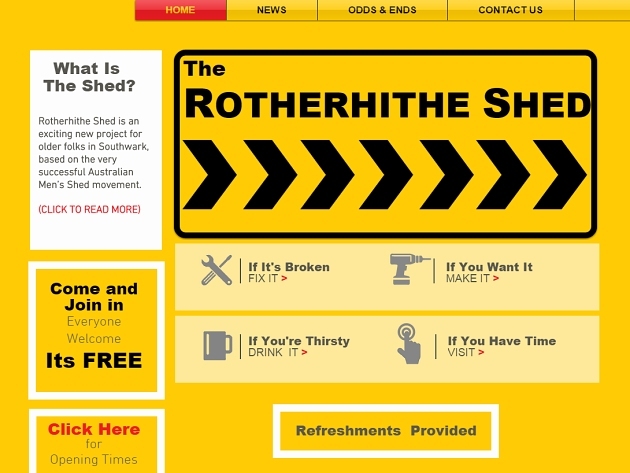 Rotherhithe Shed is an exciting new project set up for older men in Southwark (but welcomes men and women), based on the very successful Australian Men’s Shed movement. A partnership project between London Bubble Theatre Company and Time & Talents, it aims to bring together older men (and women) to put their practical skills to good use – fixing, making, whittling, drilling, sawing and generally tinkering. Sessions are held in a well equipped workshop where participants can work together on a range of practical activities. Skilled artists and technical experts are available to support the participants, and project ideas are strongly encouraged and developed. If you have something that needs mending or maintaining, be it a wobbly chair or a squeaky bike bring it along. Or if you want to help make and paint the new sign for the shed, or just make the tea – you are welcome. Let’s just look at the gender dimension. On the one hand, as you may have spotted, it doesn’t seem quite right to say it’s for “older men (and women)”, as it does here, which doesn’t make it sound like women are really welcome, and the place is basically a workshop for older men. They have had some women come along and enjoy it, which of course they absolutely can do, and there’s no reason why this sawdusty workshop full of old tools wouldn’t appear to women, but, well, the place is essentially oriented to middle-aged and especially older men. This seems a bit odd at first, but then a very reasonable point is: why not? There are a number of other services and environments that are oriented more towards the younger, the funkier, the female, and why shouldn’t older men who want to make stuff have a space too. And here it is. Of course they have seen great social benefits: the men love to get out of the house, meet other people who like doing and making things, and form social connections. Some projects are done collectively – they have made a working lathe, for instance, from diverse parts, and have created a bold statue called Rotherhithe Man, who has become a kind of mascot – whilst others are the personal pet projects of individuals. But even individual projects, done in this collective space, side by side with others, have a strong social and connecting dimension – not only in the direct way when they might help each other with a tool or task, but in the more general slow friendship-building that comes from proximity and respect and little bits of chat. 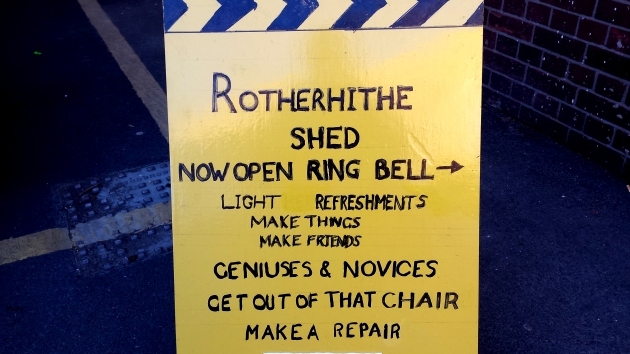 Like all good platforms for creativity, the Rotherhithe Shed includes a clear invitation to join in and do something – as made explicit, for example, on the sign pictured above – but I was curious about how they help people get over the initial hurdle of entering the unfamiliar. The men and the support workers seemed rather surprised by the question and explained that there is free tea and cake, and everybody is very welcoming. Maybe it really is that simple. At the Shed we made a video – they had asked me to be in the video, taking a look around, talking to people, and doing an interviewey bit about it – and [added later] this now appears here. 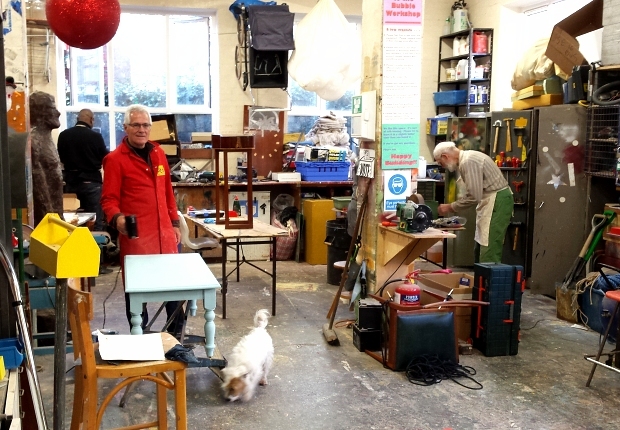 Many thanks to Jonathan Petherbridge, London Bubble, and the men of the Rotherhithe Shed, for taking time to show me around and talk about their making and connecting activities.